Two 9Ве(d,n)- neutron sources have been developed and produced at the NSC KIPT. Neutrons result from the interaction of accelerated deuterons with the nuclei of beryllium target in reaction 2Н+9Ве→10В+n. One of the sources is large-sized neutron source (LNS) with the medium energy of 5 MeV . The neutron source is aimed to produce 99Мо by the reaction 98Мо(n,γ)99Мо. The maximum fluence in a limited volume is provided by the polyethylene or Be moderator. The 9Be moderator, except deceleration, provides reproduction of nucleons due to the (n,2n) reaction. The second source is a portable (PNS) with a medium energy of 2,5 MeV . It is intended for the treatment of a number of oncological diseases. The major part of the dose in the phantom is absorbed in close vicinity of the neutron source ∼(1,5-2 сm). The fast neutron yield is about 109 neutron/s. The present paper deals with the possibility of using modern techniques of measuring of neutron radiation to build of relatively simple, compact, sensitive neutron detector on the proposed sources. It is shown that the neutron detector based on LiI(Eu) can be considered as one of the effective options for the measurements of neutron fields. 1, Akademicheskaya Str., Kharkov 61108, Ukraine; Member of the National Academy of Sciences of Ukraine, Assistant to the Director General of the NSC KhPTI. Dovbnya A.N., Tsymbal V.A., Stoyanov A.F. et al. Portable neutron generator for treatment of oncological illnesses // Problems of atomic science and technology. - Seriya «Yaderno-fizicheskiе issledovaniya». - 2016. – No.3(103). - P. 84-86. Aleinikov V.E., Archipov V.А., Beskrovnaya L.G. Comparative studies of the characteristics of neutron detectors when working with a high level of γ-radiation // Р16-97-158. - Dubna. - 1997. - 10 p.
Baranochnikov M.L. Receivers and detectors of radiations. – Moskva: DMK Press, 2012. - 634 p.
Bekurtz К., Virtz К. Neutron Physics.- Moskva: Atomizdat, 1968. - 456 s.
Buki А.Yu., Kalenik S.А. Calculation of simple cylindrical moderator for the detector of neutrons // The Journal of Kharkiv National University, physical series “Nuclei, Particles, Fields”. – 2012. - No.1001. – P. 35-42. Almaviva S., Marinelli M, Scoccia M. et al. Thermal and fast neutron detection in CVD single-crystal diamond detectors // J. Appl. Phys. - 2008. - Vol. 103. - 054501. - P. 1-7. Aleinikov V.E., Gerd V.P., Komochkov M.M. Neutron spectra behind protection of proton accelerators // IAEA-SM-167/27. - Vol. 1. Aleinikov V.E., Beskrovnaya L.G., Mokrov Y.V. Study of the possibility of measuring 10В neutron counter in a combine moderator neutron dose // INR Р16-2008-46. - Dubna. - 20 p.
Timoshenko G.N. Methods of experimental nuclear physics. - Dubna 2. - 178 p.
Belogorlov E.A., Britvich G.I., Krupniy G.I. et al. Metadological issues of application of Bonner spectrometers in a radiation research // IFVE 85-3. – Serpuhov, 1985. - 22 p.
Illin D. Modern position sensitive neutron detectors. - «FKC», 2011. - 36 p.
Marin V.N., Cadikov R.A., Nedorezov V.G. et al. New type of scintillation detectors of thermal neutrons on the base ZnS(Ar)/LiF and avalanche photodiodes // INR RAS 1401/2015. – Moskva, 2015. - 12 p.
McGregoretal D.S. Thermal neutron detection with Cadmium Zink Telluride Semiconductor detectors // NIM. - 1996. - A 381. - P. 498-501. Kovalchuk V.D., Trotsik V.I. Diamond detector as a fast neutron spectrometer // PTE. - 1995. – No.1. - P. 29-34. Takahiko A., Yasushi O., Kiyonari H., Chizuo M. A neutron detector using PIN photodiodes for personal neutron dosimetry // NIM. – 1992. - A314. - P. 590-594. Bochek G.L., Deiev O.S., Kiprich S.K. et al. Registration of the thermal neutrons using uncooled planar detector // Problems of atomic science and technology. - Series “Nuclear Physics Investigations” - 2016. – No.4. - P. 107-112. Bruckner G., Rauch H. A Position sensitive Gd detector for thermal neutrons // J. Neutron Research. - 1996. - Vol.4. - P. 141-147. Kutniy D.V., Kutniy V.E., Odeychuk N.P. et al. 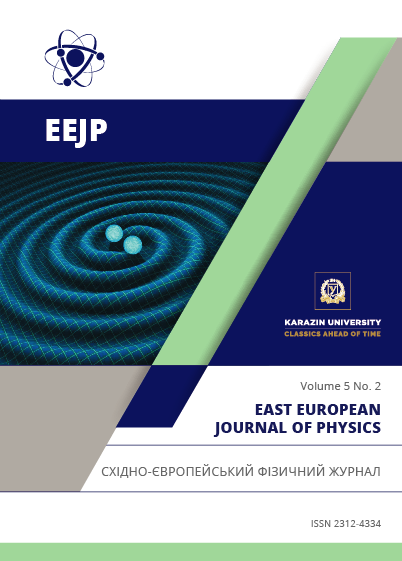 Use of the active well coincidence counter for the semiconductor neutron detector development // The Journal of Kharkiv National University, physical series “Nuclei, Particles, Fields”. – 2008. - No.823. – P. 71-77. Britvich G.I., Vasilchenko V.G., Galitskiy Y.V. et al. Prototype of a neutron detector based on a boron-counting plastic scintillator // PTI. - 2004. – No.5. - P. 5-19. Filhoetal Т.М. Development of neutron detector using the surface barrier sensor with polyethylene (n,p) converter // NIM. - 2001. – A 485. - P. 441-447. Mesquita C.H. Development of neutron detector using the PIN рhotodiode with polyethylene (n,p) converter // IEEE. - 2002. - Vol. 50. – No.4. - P. 1170-1174.